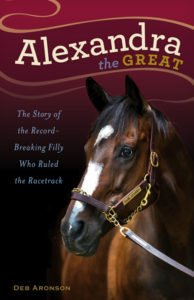 This middle-grade, non-fiction book is about the epic filly, Rachel Alexandra, who in 2009 became the only three-year-old filly to ever win Horse of the Year. Although this book is about a horse, it is also, more fundamentally, about how a strong female, supported by a group of people who believe in her, can excel despite heavy odds against her. You can buy the book at Amazon or at Chicago Review Press . Don’t forget to write a review at Amazon or Goodreads and spread the word!